The 3.5/3.9 are similar to the 3.4. I wonder how hard it would be if you started with a set of grand am turbo headers and some 3.5/3.9 header flanges. The rear header needs heavy modification I have read to fit in wbodies but still I wonder how solid of a starting point that would be. Like I said the problem is we don't really have a exhaust manifold per say It's pretty much a collector so in order to bolt a turbo in the front we would have to fab some sort of up pipe off the collector or maybe fab a crossover pipe with a 3 or 4 bolt flange which would take away from what little room we have. That's why I suggested a remote setup which also leaves more room for the intercooler. Only lfx turbo systems I have seen are on the end of the downpipes under the car and I'd say for a good reason. That's all the easy stuff as far as fab work goes. I wish these were like the gm v8 cars where you could run flipped truck manifolds for turbo manifolds. Anyway I think anyone serious about wanting to turbo a lz engine should just run twin remote turbos right at the end of the downpipes and be done with it. That's what gm did to run a twin turbo lfx in the new caddy. Can't the parts be interchanged between motors. I haven't seen anything that suggests the motor is different from rwd platforms. Can't parts just be swapped in? It's a 3.5 impala with a 4 speed auto and front wheel drive. I was gonna get rid of the car but I bought some things and had some bills and now the 10k that was going down on a ls2 gto or a c5 z06 vette is spent and I gotta save up again. I do plan to build a reliable force induced v8 with around 550 to the wheels. Next time you have 10k get in touch with me. I'll put you in a real turbo car. 10k could by one hell of a turbo regal. I'm talking Grand National,T-type and Turbo T. You put your turbo on the LS1 or LS2 and give me the same amount to mod my turbo regal and it will get you everytime lol. On a serious note if your ever looking let me know I have a lot of knowledge with those cars. 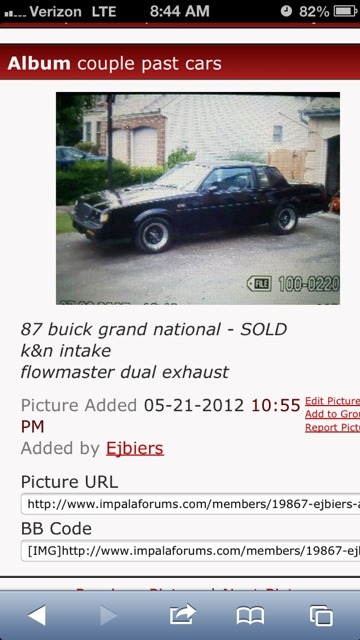 I had a 87 grand national lol not heavily modded though. Also had a high 9 second mk3 supra before I got the impala as a commuter among a rap sheet worth of other toys lol.